In this instalment of our Top Picks for Beginners guide, we are checking out an area that is far more significant than you may at first realise: amplifiers. It may not be immediately clear to new players but the amp, more than any other component in your setup, plays the biggest role in determining your sound. More than the guitar? We’d say definitely yes! We know, it’s a bit of a surprise. The guitar (and your fingers) of course play a massive part in the generation of tone but, ultimately, it is all being funnelled through the amp and fired out through its speaker. Everything you do and play on the guitar will be shaped by the amplifier so getting the correct one for your needs, desires and expectations is massively important. As always, however, guitarguitar is here to help! This blog is dedicated to what we’d term ‘practise amps’ or ‘house amps’. This type of amp operates in the same general manner as an amp you’d use for gigging (plug your guitar in, switch it on, dial in your preferred settings) but they are designed to function at their best in low volume situations. Practise amps often (though not always, as we’ll see) pile on the functions and effects to make for a one-stop tone machine that gives you everything you need in one box. You normally get a lot of bang for the buck as well as a smaller, more portable (house friendly, basically) physical package. These days, most practise amps use computer technology within them to create their sounds. We talk about this as being ‘Digital Modelling’ as the sounds on offer are generally sampled versions of famous full-sized amps. Doing things this way allows small, affordable amplifiers to make a wide variety of realistic and convincing amp sounds culled from half a century of Rock ‘n’ Roll. This is a far cry from previous decades, when fledgling players had to tolerate horrendous ‘wasp-in-a-bottle’ overdrive sounds from nasty little amp boxes, almost as a test of the player’s resolve until they progressed to something more appropriate. Now, even the most basic beginner has access to a variety of world class tones at the touch of a button or a twist of a dial. Happy times indeed! But which amp to go for? The market is wide and very competitive in this area. Every major brand offers something and they all want you to choose them. It can be a bewildering decision. Fear not! We told you we would help and we shall! We have gone through our entire stock and selected what we regard as the pinnacle of practise amps for beginners (and anyone playing at home, really). Each model will have its own particular strengths but all will be worth your time and money. So, read on, soak up the knowledge and continue your quest for guitar excellence with a keener eye, a surer grasp and a more confident stride! Let us begin our journey with one of the most classic amp brands in existence: Marshall. You will undoubtedly know this brand from years and years of live pictures showing Hendrix, Blackmore, Page and all the rest rocking out large with Marshall amps stacked up behind them. They are as Rock as it gets but a full, roaring Marshall stack is somewhat excessive for the living room so let’s pitch things down a little! 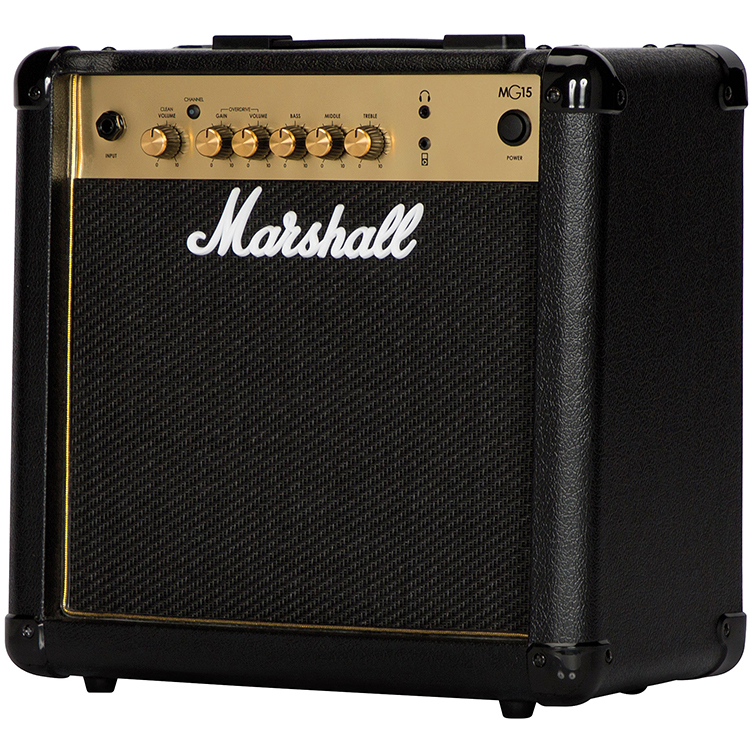 The Marshall MG15G brings all of the fine gold and black livery of a classic Marshall amp right into your home in an attractive 15-watt package. This amp is very straightforward and will suit fans of Classic Rock who want to get busy playing without fussing around with controls. The front panel is about as simple as it gets: you have your guitar lead input, six control knobs for volume and EQ and a button for choosing between a clean (i.e. normal) sound and an overdrive (i.e. Rock) sound. You also get mini jack inputs for headphones (so you can practice without disturbing you-know-who) and for connecting a device like a phone or a tablet and playing tunes and tracks through the amp. This is a fantastic practise function and is worth taking advantage of: jamming along to your favourite tunes is a very quick and effective way to improve your playing so keep that in mind! Sound-wise, the Marshall MG15G offers up a very recognisable take on Marshall’s world-famous crunch tone. For all Rock styles apart from the heaviest of modern Metal, this will be just what you need. Because of its deliberate simplicity, there are no presets, no effects, no anything other than good honest tone. If you are not quite ready to play around with effects, this is a great buy. If, however, you ARE interested in adding some effects to your sound, there are loads of options. One brand who have been smashing it in this department for years is Line 6. 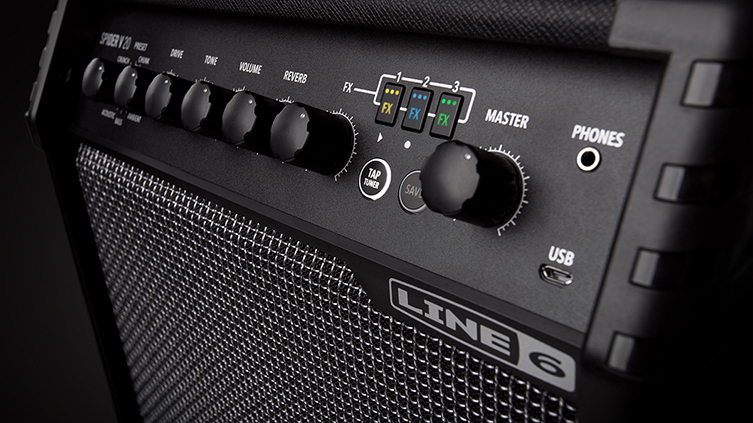 Line 6 are known for their game changing innovations regarding amp modelling. They spearheaded the whole movement in a way and their Spider practise amps have been a top seller for nearly two decades. Now in their fifth generation, the Spider V series are of course their best yet! For this article, we have chosen the Spider V 20 combo, a 20-watt model with an 8-inch speaker. This is more than enough for home use and also has a USB connection for connecting to your computer and using with the Spider Remote app. This software gives you even more choice and functionality than the hardware itself gives you, which in itself is considerable. But let’s not get ahead of ourselves here! This amp has 16 presets to use straight away. These are made up from an overall pool of 78 amp, 23 cabinet and 101 effect models. You get a range of tones that span 80s clean sounds to vintage Blues tones and molten Metal meanness. Each sound has a realism and authority that is most surprising from such a humble package. Lots of these sounds are available via the app so do bear that in mind. Having said all that, this is a very simple amp to use. It’s hardly more complicated than the Marshall and does have a plethora of reverbs, delays and other effects to use too. Next up is an amp that is proving to be a massive best seller. BOSS, the guitar section of musical instrument giant Roland, is a legendary brand in its own right. Effects pioneers and makers of some of the biggest selling pedals in history, BOSS know a thing or two about dialling up great guitar tones. Their Katana range of amps is the latest in a long line of excellent practise amps (formerly made under the Roland name) and is perhaps one of the greatest sounding home amps we’ve ever heard. The range contains a few models, but we will look today at the 50 watt KTN-50. The KTN Katana 50 is a little bigger and louder than some of the other amps in this article but its impressive power can be scaled back via a built-in Power Control to bring this combo directly back to the kinds of volumes that make sense for home use. The full size 12-inch speaker brings a larger, more muscular tone regardless of volume. There are five different channels to be used including one made specially for electro acoustic guitars. Another is called the ‘Brown’ channel and is a not-so-veiled reference to Eddie Van Halen’s famous ‘brown sound’. For those who maybe don’t know, Eddie’s brown sound is probably THE most sought after and influential guitar tone outside of Hank Marvin and Jimi Hendrix. Did they nail it? 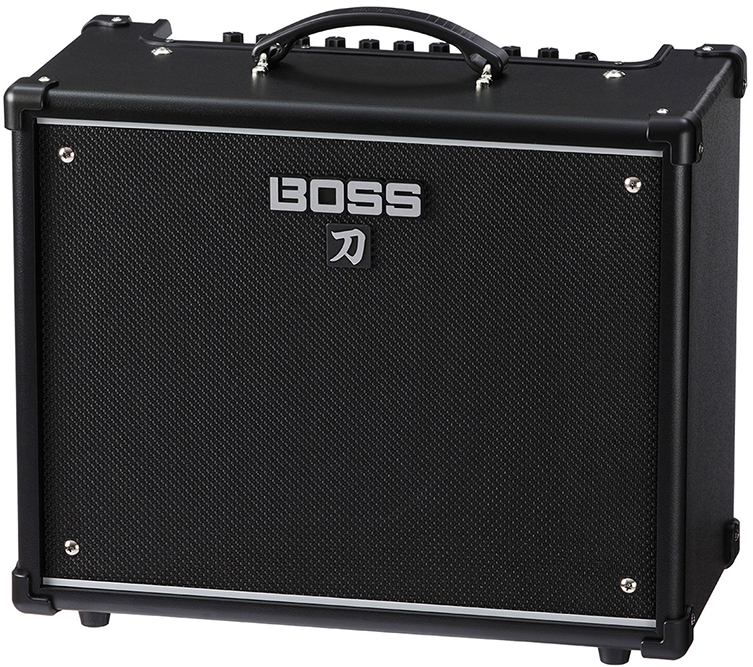 Did BOSS put the cranked Van Halen tube amp sound into an affordable solid-state combo? Well, let’s be realistic and say that NOTHING will get you that sound unless you have the man’s brain and hands. And we can’t do that for you. But we can say that the drive sounds available on this amp (and the sounds in general) are spectacular and well worth the slightly extra investment. If Hard Rock and flashy lead is something you want to pursue, the Katana’s Brown channel is something you will get very excited about. The Katana has onboard FX too plus the potential for deeper editing, just like the Line 6 Spider, via computer software. Hot on the heels of these choices are a number of amps from Blackstar. 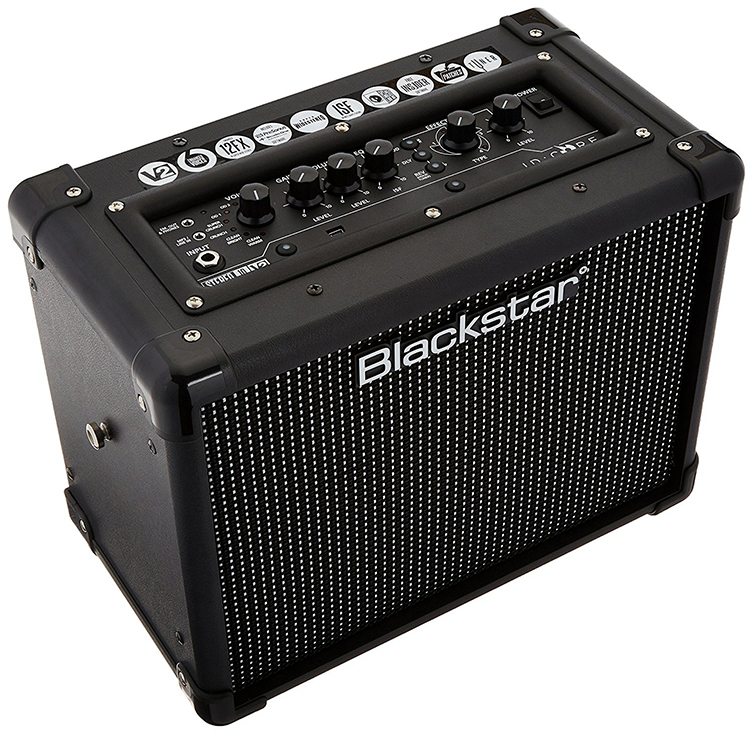 Blackstar are a relatively new company, but they have wasted no time in establishing themselves as heavyweights in the realm of guitar amps. We keep seeing more and more Blackstar logos appearing on the world’s biggest stages, being played by some of the world’s biggest artists. There are actually quite a few different Blackstar amps that qualify to be included within the scope of this blog, so we’ll spend a little time with them. Each amp is here for a different reason. Let’s turn our attention first of all to the ID Core 10 V2. As Its name suggests, this is the second edition of the popular ID Core range of amps. This little 10-watt beast actually has two speakers within its small chassis for a bigger audio spread and a range of sounds that are anything but ‘boxy’. 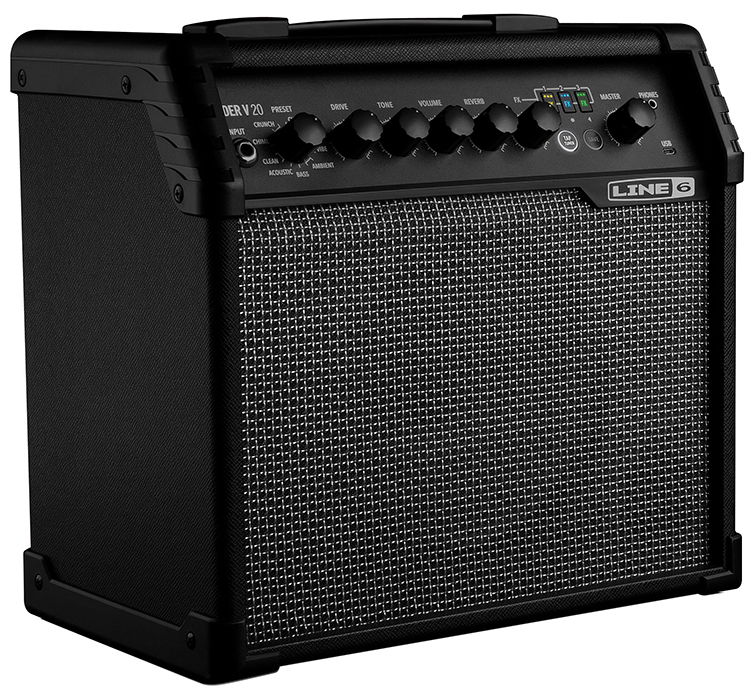 The ID Core 10 V2 is a very simple amp with easy access to its myriad features. Six distinct voice types are selectable from clean through crunch to high-gain. Alongside this is Blackstar’s patented ISF feature. ISF – Infinite Shape Feature – is like an overall tone-character shaping device. With the ISF knob turned hard left, you have an ‘American’ type of overall tone whereas the hard right will land you in ‘British’ territory. Of course, the whole idea is to place the setting somewhere between the two and find yourself a tone that is unique to yourself. It’s an inspired feature for sure and very useful. The ID Core 10 V2 is portable, attractively priced and sounds great: it’s hard to beat! Some guitarists will definitely want genuine valve tone though. For the uninitiated, all classic amps back in the day used vacuum tubes (they look like big light bulbs) in the preamp (tone shaping) and power amp (as it suggests, providing the horsepower) sections. These all-tube designs were the norm back in the 60s and to most guitarists, still sound better than ‘solid state’ or ‘digital modelling’ amps which are the types we’ve been looking at today. These days, the jury is truly out as to what sounds the best (the gulf between the technologies in terms of sound quality used to be MUCH wider) but many players just want to genuine, bona fide tube amp experience. Fair enough but the problem lies in volume. Valve amps (the terms ‘tube’ and ‘valve’ are interchangeable in this context) tend to sound their best when played at considerable volumes. This is not great for those looking to play in a flat or house in the suburbs. Not, that is, unless you have an amp like the Blackstar HT5-R! This great little combo is all-valve and runs at 5-watts so you can wind up the volume and get those valves cooking without bringing eternal shame and hate upon your household! 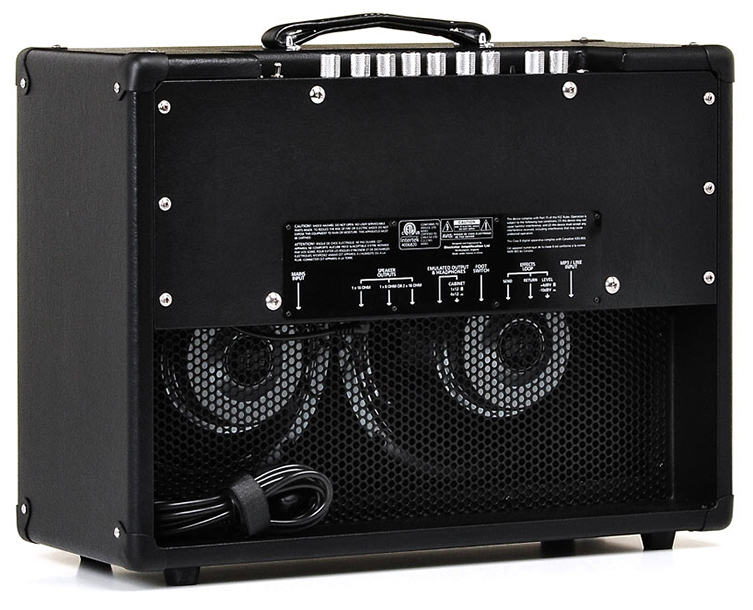 It’s a great sounding amp and has two footswitchable channels and reverb too. For practising and recording, it’s a great choice! But what if even 5 watts is too much power? After all, valve watts are considerably louder than solid state watts! 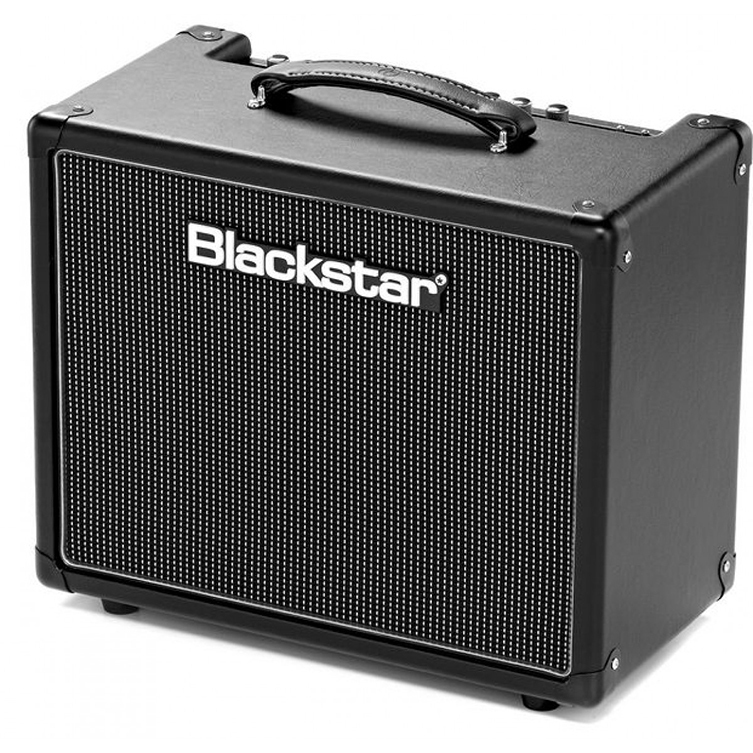 In this case, we recommend the Blackstar HT-1R! It’s a 1-watt version of the HT-5 with all of the features and just less power! You can wind this up for maximum gain and, whilst it is not quiet (volume is measured in decibels, not watts, remember), it hits that perfect point where volume meets voltage, resulting in those rich valve tones that everybody wants. We love plugging into this amp and just blasting away for hours. It’s addictive stuff! If you love the idea of these little valve combos but can handle a little more size and ‘spread’, we invite you to check out the HT-5210 combo. Though still small in realistic terms, it is larger than its Blackstar brethren in this article. That is because this little beauty houses two 10-inch speakers (see pic below)! It’s still all-valve and it still has two footswitchable channels but this 5-watt combo has an altogether more mature and expansive sound. We would record with this all day long! 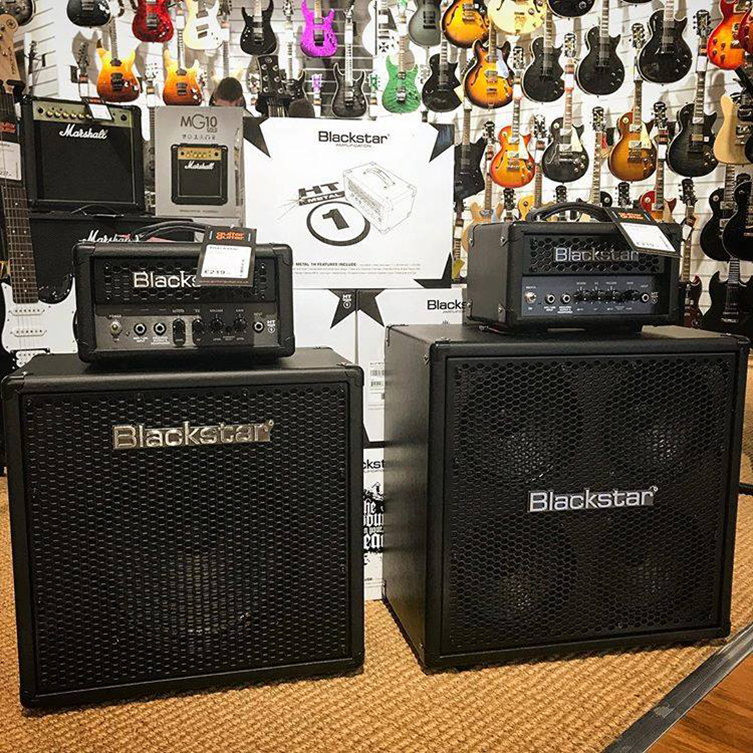 All of these Blackstar amps have external speaker jacks too, so you can plug into a larger cab if the opportunity presents itself. 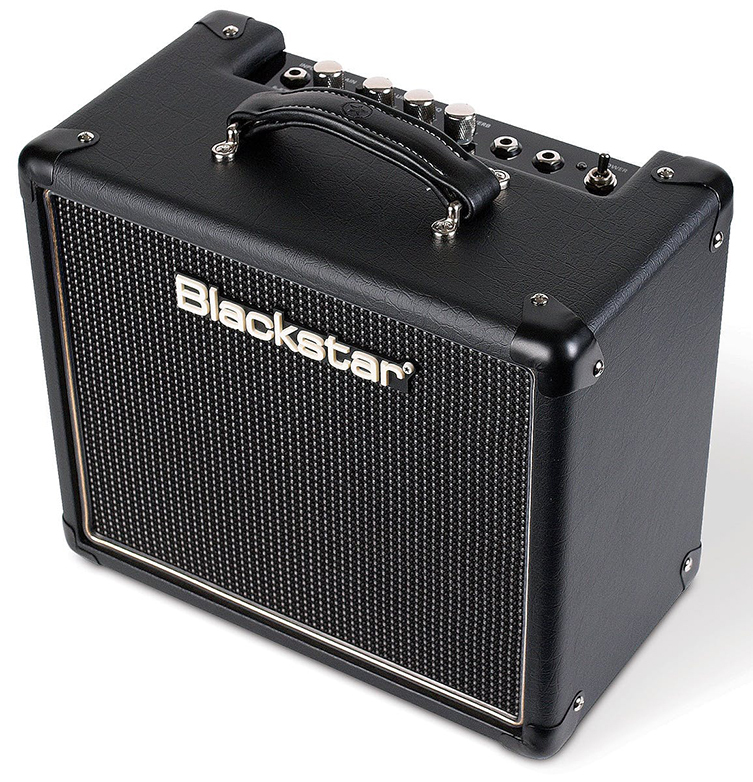 These Blackstar HT combos will satisfy most players looking for authentic valve tone. All sounds up to Classic Rock are catered for with personality and quality to spare. But what about the Heavy Rockers? Worry not, Metal fans: we have just the thing! Check out this awesome mini stack! The Blackstar HT-Metal 1H 112 Mini Stack puts together a single 12-inch speaker with a dinky little amp head which is the near definition of wolf-in-sheep’s-clothing. This thing sounds like a fire-breathing dragon! If Metal is your thing, plugging into this little beast will instantly connect you to a fantastic high-gain distortion with tightness and low end. It’s a superb sound and all the better for the small size! Recording studios will loves this as much as bedroom/home studio players. The ISF control is here to sculpt that extreme gain and it has a single watt of power, so you can dime that volume knob and just dig in. Perfect. So, our journey into the land of amps for the beginner/home guitarist is now at an end. We hope we have illuminated some of the darker corridors that make up this wonderful maze we call music gear! We are always here to help so please do drop us a line or visit any of our stores if you need further help in your quest. All of these amps are worthy choices. Arm yourself with this guide and choose well.